Why do many collectors pay higher prices to eMoviePoster.com when they can buy the "same"
posters elsewhere for less money? One of the questions we are asked most often is how we get the prices we do for so many items that can be found elsewhere on the Internet. People look up prices in our Sales Results Database (which lists all of our sales results from 1990 to the present! ), and they see prices our customers paid that are sometimes quite a bit higher than they have seen the "same poster" sell for. But is it the "SAME POSTER"? When we sell an item, it is given a conservative condition grade, and we give a detailed description of the poster's defects. 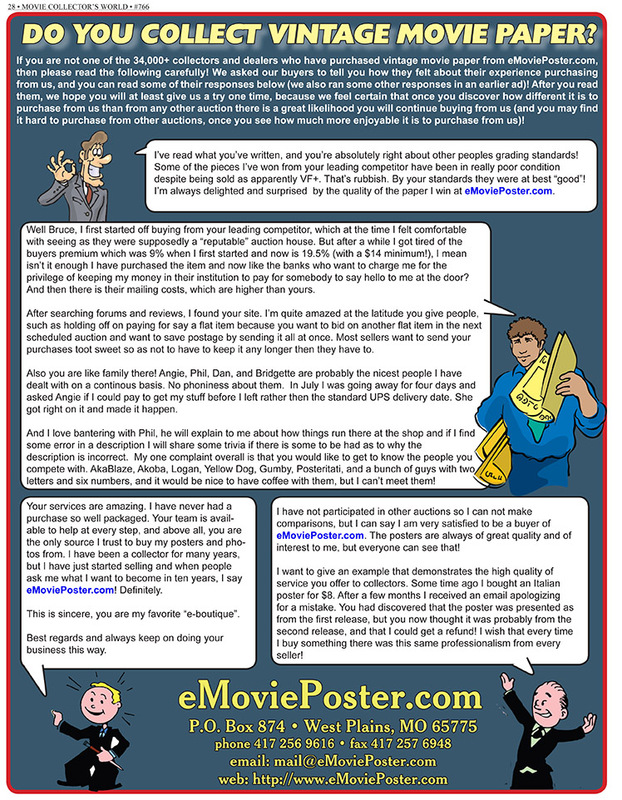 WE NEVER OMIT ANY DEFECTS TO MAKE THE POSTER SOUND BETTER THAN IT IS, AND WE NEVER "INFLATE" THE CONDITION GRADE! But we have bought many hundreds of posters ourselves, and we know for an absolute fact, that many sellers do not adhere to our standards! It has gotten to the point where we are pleasantly surprised if we receive a poster, and it is even CLOSE to the condition grade the seller said it was in, and we are even more pleasantly surprised if the poster does not have significant undisclosed defects! 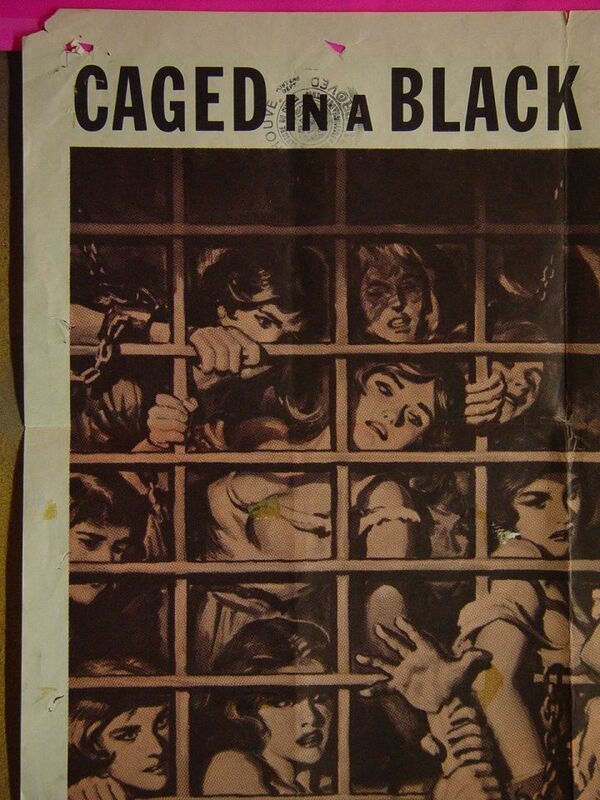 Here is a poster we purchased on eBay. The seller described it as being in "very good to fine" condition, and mentioned that there was "slight" bleed through from writing on the back. They provided a small fuzzy image w here you could not see any writing anywhere. Of course, you could say that we should have e-mailed the seller and asked him to describe the poster further. But being that it is a relatively inexpensive poster, we did not. 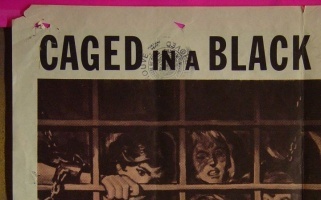 Here is a photo of the poster we received, along with a thumbnail of part of the writing on the back that can be seen from the front (click on the thumbnail to see a large image of all the bleed through writing, which is over much of the image). 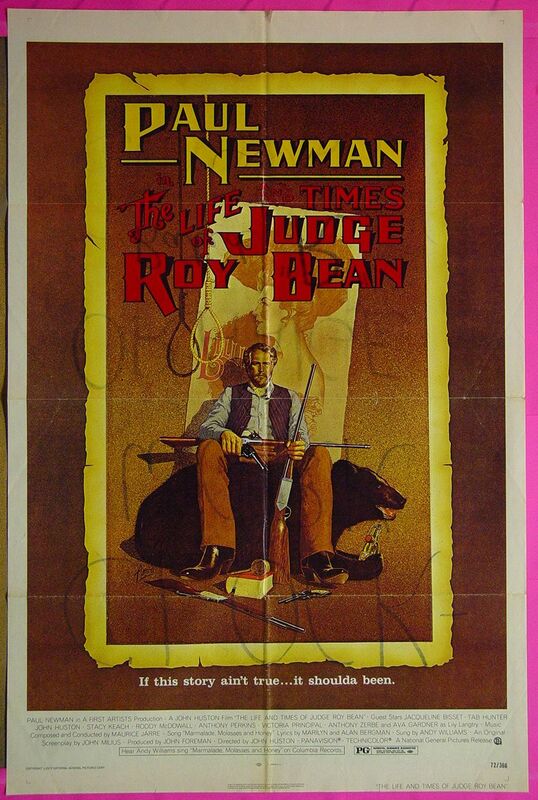 IF WE HAD BEEN THE SELLER OF THIS POSTER, WE WOULD HAVE DESCRIBED IT AS "FAIR" CONDITION, AND NOTED THAT IT HAD MAJOR BLEED THROUGH FROM WRITING ON THE BACK. Now, of course, we would have probably gotten $1 for the poster, but, on the other hand, the seller who deceived us will never get any more of our money, whereas we have many thousands of repeat customers! Here is another poster we bought online. It was described as being in "very good" condition, with "a few rips and tears". Again, the picture was so small and fuzzy that you couldn't make out much of anything. On this page are images of the poster received (again, you can click on the thumbnails to see full-sized images of the damaged areas). Note that the poster has a large censor stamp, several areas of paper loss, tape stains in the image, etc! If we had sold this poster, we would have described its many defects and would have graded it as being in "fair to good" condition. I find it hard to believe that the two different people who sold us these posters did not know that they were intentionally deceiving us! These are not two unusual cases. Over and over, we get posters that are clearly over-graded and have defects that are ignored. 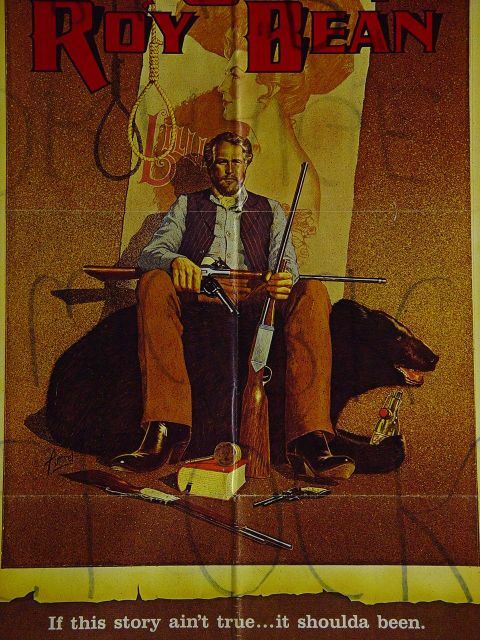 The next time you are considering buying a poster from someone else, you might consider doing what we do, which is to assume that the poster is in lesser condition than they say it is, so as to offset some of the optimistic grading commonly found with unscrupulous dealers. And when you buy a poster from us, you might consider bidding a little higher, knowing that the poster is surely in no worse condition than we described it, and you may actually be pleasantly surprised when you receive it (because we are a "harsh" grader). THE CHOICE IS YOURS! The above is not to say that we don't SOMETIMES get more money for an item than another seller who is selling the SAME item in virtually the same condition. This can often be explained by the "comfort level" that our buyers have, because they know we do everything possible to make 100% certain you have a positive buying experience, before, during, and after the sale! When you compare our auctions to those of other auctioneers (on eBay and elsewhere), is there really any comparison? If you have purchased from other auction companies (or those who auction on eBay), how do they compare to our company, eMoviePoster.com? 1) ...describe ALL their items accurately (both in regards to condition, and year of release of the item), and gives you a conservative overall condition grade for every item? 2) ...package ALL orders super-securely, with custom made double-strength packaging? 3) ...have a no questions asked return policy on EVERY item, and listen and act quickly on any complaints you may have (and if they are at fault, do they pay all costs and give you free bonuses as an apology)? 4) ...give you an absolute ironclad guarantee of originality of EVERY item they sell (and take back any item that was inadvertently misdescribed)? 5) ...send ALL orders very quickly (usually in 24 to 48 hours of receiving payment)? 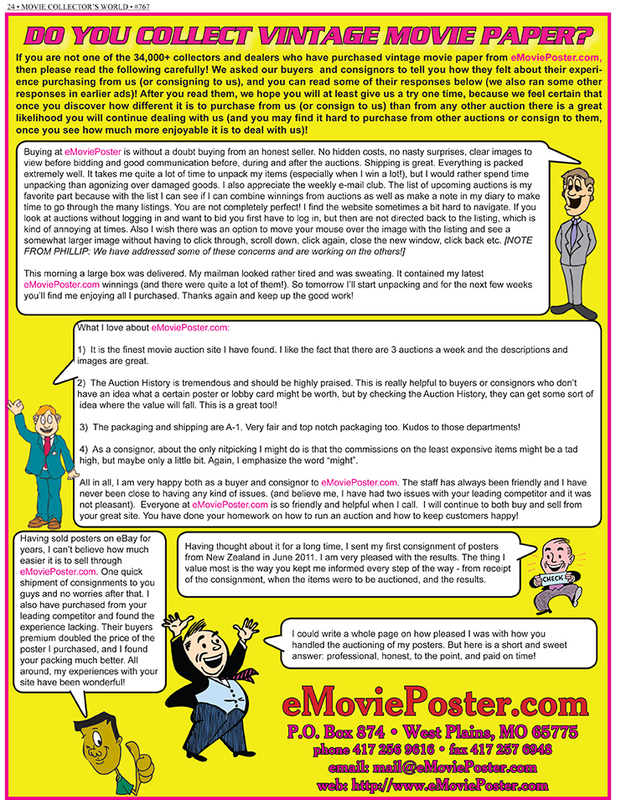 6) ...quickly add any corrections when they make an error in an item's description (either in regards to the film itself or the condition of the poster), and do they immediately e-mail all bidders on that item? 7) ...offer great FREE bonuses (both to those who buy single items, and those who order multiple items in a single week)? 8) ...have a cancellation policy that lets you cancel small wins that are under the cost of shipping? 9) ...let you combine wins from up to FOUR different sets of auctions, and pay only a single shipping charge if they can be sent in a single package (up to EIGHT sets of auctions if you live outside the U.S.)? 10) ...only charge you the actual shipping cost (sometimes below! ), plus just $2 for packaging materials? 11) ...provide unenhanced supersized images of ALL of their items (ones that show 100% of the item, and let you see virtually every flaw that the item has)? 12) ...start all of their items at $1, with no reserves on ANY item? 13) ...have deceptive "buyers premiums" that enrich themselves, but come out of the pockets of both buyers and sellers? 14) ...have phone, fax, and e-mail service and the ability to take ANY kind of payment you choose to make, any way you choose to make it? 15) ...let you see WHO is bidding on what items (including all under bidders), both during the auctions and afterwards? 16) ...have an "autoship" option, where your purchases can be automatically sent the day after every auction ends? 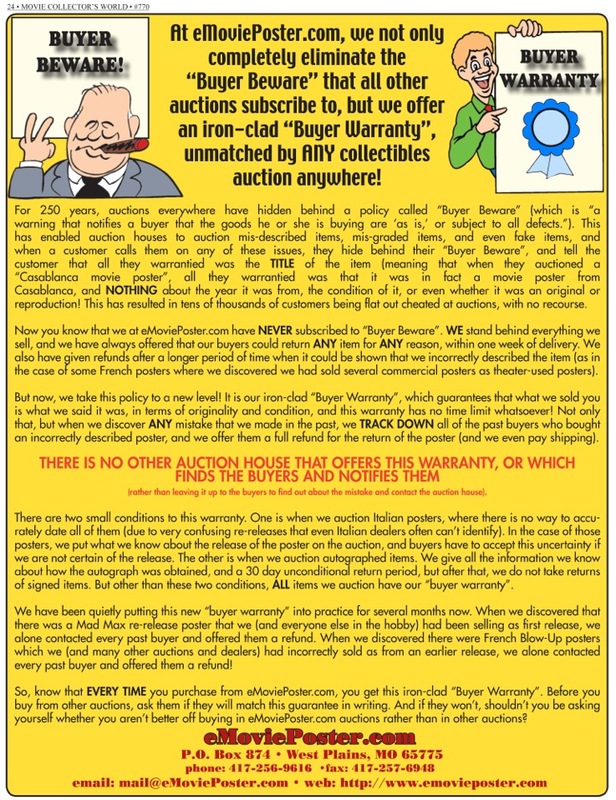 17) ...e-mail you within hours of the auctions ending, giving you a combined list of all your purchases, and a combined total, along with full payment instructions? 18) ...send you an e-mail as soon as they receive your payment, and another e-mail as soon as your purchase ships (along with a tracking number, if applicable)? 19) ...only send you one promotional e-mail per week (none if you ask to never get ANY! ), and NEVER sell or trade your contact information to anyone ever? 20) ... have a 19 year track record of selling vintage movie paper to over 30,000 movie paper collectors worldwide? 21) ... have a search of their current items that includes directors, all of the top cast, genre, poster artist, and more, that allows you to quickly locate items you are interested in? 22) ... have an ACCURATE sales results database of over 330,000 records that only gives you actual paid for prices (no sales that fell through, items that were returned, items that were renegotiated, etc.)? 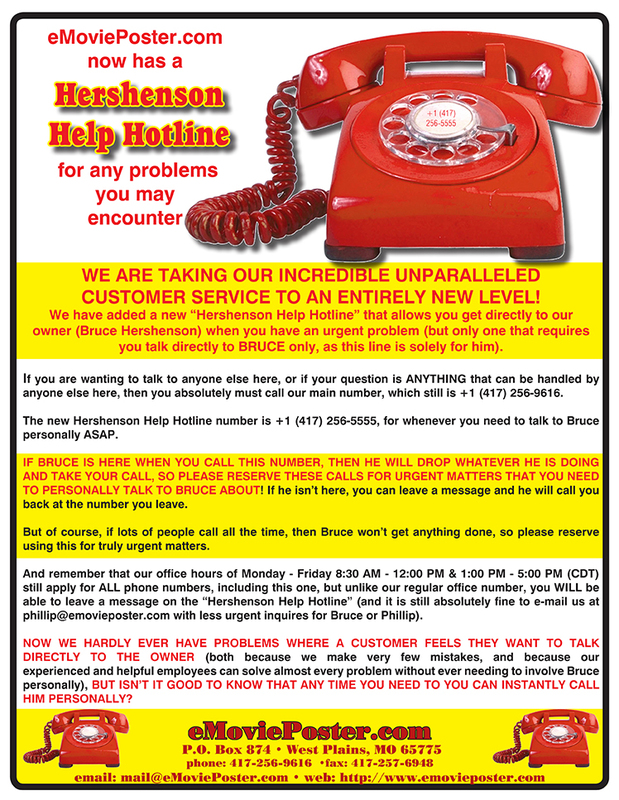 23) ... have TRUE customer service, and if you are not happy with how you are being treated, or how your order is handled, either before, during, or after the sale, you can talk or write to the owner of the company (Bruce!)? 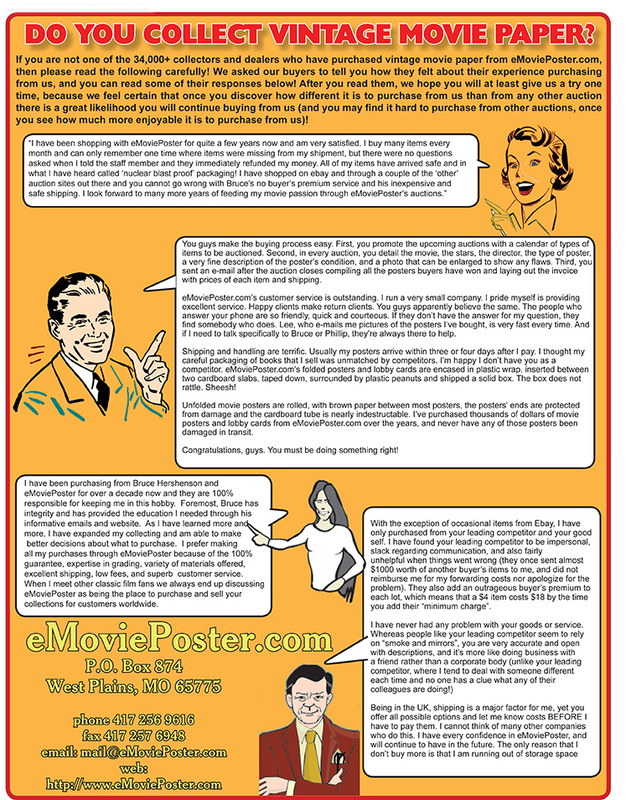 If the answer to ALL of the above questions isn't yes, then you aren't dealing with eMoviePoster.com, the world leader in movie paper auctions, now in our 19th consecutive year of million dollar plus sales! "You guys make ME happy! I love everything about your business. Besides the merchandise being just as described and getting cool incentives when I win, these things would be useless without the superb packing job you do to get it to me. I appreciate YOU so much!" Go to our "why we ship the way we do" page to learn about the differences between our packing and those of other sellers.